On Saturday afternoon, executive editor David Savona and senior contributing editor Gordon Mott introduced to the Big Smoke stage former Fuente executive Wayne Suarez. Twenty years ago, the Fuente Fuente OpusX made its commercial debut. This wasn't just another cigar. It was a brand with an unusual name and an unusual wrapper. Today, it has turned into a phenomenon. The wrapper is from the Dominican Republic, as is all the tobacco in the cigar. But before the advent of OpusX, it was believed throughout the industry that the Dominican Republic couldn't produce quality wrapper tobacco. The Fuente family disproved this notion and the OpusX was the result. 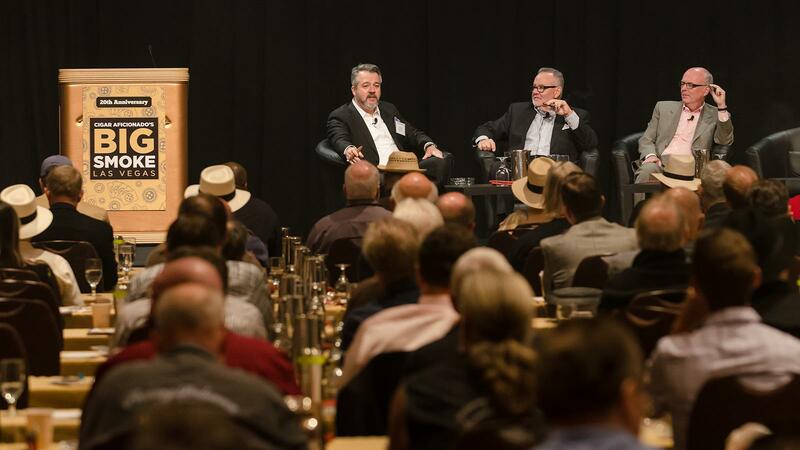 On Saturday afternoon, executive editor David Savona and senior contributing editor Gordon Mott introduced to the Big Smoke stage former Fuente executive Wayne Suarez, who was with the Fuentes at the inception of OpusX. Suarez told personal anecdotes about the brand to an entire ballroom of more than 500 cigar lovers. The tone was jovial and relaxed, and Suarez addressed the entire crowd with the sort of casual ease one might find between old friends. "It was an amazing time to be with [Carlos] Carlito [Fuente Jr.]," recalls Suarez. "Crazy too, and I mean that as a term of affection. Carlito has such an imagination and [Carlos Fuente] Senior doesn't know how to say no." As the story goes, Fuente Jr. was particularly perturbed by the fact that none of his cigars prior to the OpusX were fully Dominican. He wanted a cigar that fully represented the Dominican Republic, both in construction and in materials. The problem was the wrapper. Conventional wisdom stated that the soil of the Dominican Republic was unsuitable for cultivating wrapper. "There was no pedigree for wrapper in the Dominican Republic," added Savona, "but the Fuentes proved everybody wrong." After purchasing the land from Angel Oliva, the Fuentes created Chateau de la Fuente, a pristine tobacco farm in the Dominican area of El Caribe dedicated to growing wrappers. "We knew the tobacco was special right from the beginning when we grew it in 1992," said Suarez. "The farm is like Disney World, and the cigar industry wouldn't be what it is today without Angel Oliva." Before the Fuente Fuente OpusX cigar even had an official name, it's working title was ProjectX From Planet 9. The Ed Wood-ian name eventually evolved to OpusX. Once the tobacco was deemed to be exceptional, the Fuentes went to work. "Watching Carlito create the blend was like watching a mad scientist at work," said Suarez. "But he's a tinkerer. He's always tinkering with blends. We started by taking some Fuente Añejo rollers and having them roll OpusX, but the process is very slow with a lot of attention to detail. The rollers who make OpusX are paid more to make less. They're aged a minimum of a year." Former Fuente executive Wayne Suarez, who was with the Fuentes at the inception of OpusX. Suarez continued with plenty of stories and more personal anecdotes—stories where he got in big trouble for sending out Arturo Fuente Hemingway cigars to retailers before the full in-house aging process was complete; stories about the Dutch printer Peter Vrijdag who went through a frustrating ordeal to get the OpusX band perfect; and even stories about people who believed they like strong cigars, but couldn't handle the raw power of the OpusX. When the cigar made its commercial debut in 1995, the market was smoking mostly mild to medium cigars. Relative to the market 20 years ago, OpusX was an absolute powerhouse. By Suarez's palate, the OpusX's signature quality is its peppery tobacco. "It was the first cigar to be fully born in the Dominican Republic," Suarez said. "It's been 20 years and we still can't make enough of them." This year not only marks 20 years of OpusX in the market, but also 20 years of the Cigar Aficionado Big Smoke. "I'm amazed at all the people that still come even after 20 years," said Suarez. "Twenty years of Big Smoke. Twenty years of Opus. That's a nice tag team." After learning about the history of OpusX, it was time for lunch. Guests filtered out of the main auditorium and into the dining hall.